Using fresh ingredients always makes cocktails more interesting and when I noticed I had some raspberries and basil in the fridge it sounded like a great combination of flavors. Basil has a light savory flavor while raspberries offer a balanced blend of tartness and sweetness. A perfect combination of flavors for a spritzer.Spritzers are a drink originating in Germany, traditionally using a combination of white wine and club soda. The modern twists on this classic have begun using spirits instead of white wine, a change which allows for a refreshing drink which can be flavored in whatever way you see fit. 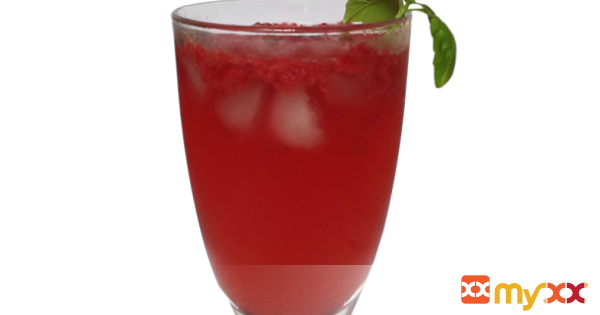 By using vodka, a notoriously flavorless spirit, the raspberries become the star of the cocktail with subtle undertone of basil and honey. A truly refreshing drink. 1. Begin by muddling the raspberries and basil with the honey simple syrup in the bottom of a highball. 2. Add the vodka and lime juice and stir with a cocktail spoon once the raspberries have reached the consistency of a puree. 3. Fill the glass with ice and top off with club soda. 4. Garnish with a stem of basil and serve with a straw.